Everyone dreads those obvious signs of aging: gray hair and wrinkles. However, the first sign of aging that creeps up on most of us, is neither of these, it is actually the under eye area that begins to lose its youthful appearance first! This could be puffiness and eye bags, or dark shadows and circles that appear due to too much work and stress and not enough sleep, or it could be those first lines that appear at the outer corners. Either way, we look in the mirror and realise that we are looking tired – and older than we want to! Fortunately there are some effective ways to treat all these problems in order to minimize their appearance and achieve a fresher, more youthful appearance. 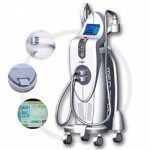 On this site, you will find Home Remedies, information about effective treatments and unbiased product reviews. Top Tip to quickly find articles on a topic that interests you, use the site index link (right at the top of every page, above the header image), to find the information you are looking for – alternatively, check out our latest articles list or browse by category. 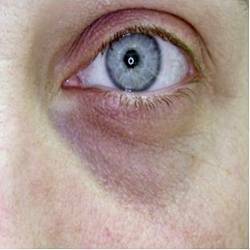 What Causes Dark Circles Beneath the Eyes? One of the biggest misconceptions about these dark shadows is that they are caused by tiredness. While it is true that they may be a symptom of exhaustion, there are many other possible causes. If you get plenty of good quality, undisturbed sleep and still find you have bluish-black shadows in the delicate skin around your eyes, it may be a sign of ill health. An allergic reaction to something, a skin condition such as eczema and nasal congestion are some of the other health issues that could lead to this problem. Those dark areas may simply be part of the normal aging process. Puffy eyelids and hollows beneath the eyes, which occur as people age, can cast shadows to create the impression of darkish rings. 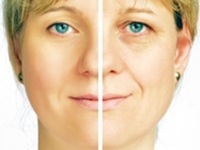 As people age, their skin thins and fat and collagen is lost from the body. 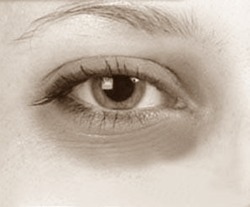 This often makes the blood vessels beneath the surface of the skin beneath the eyes more noticeable. Lifestyle is a significant factor in all aspects of your health and appearance. For example, extreme stress from a hectic lifestyle, juggling home, family and a demanding job, can definitely have an adverse effect on the appearance. If you habitually rub or scratch your eyes, perhaps due to an allergy, irritation or nervous habit, you are bound to affect the appearance of the skin beneath the lower eyelids. Genetics may also play a part; some people are simply more prone to the shadows in the under eye area than others. Another common misconception is that only adults of a certain age are affected by them. Some children can develop them too; again, this may be down to tiredness, lifestyle, genetics or ill health. The good news is that no matter how old you are, many simple, inexpensive treatments are effective. 1. Use extra pillows in bed to raise your head; this stops fluid from pooling in your lower eyelids, which can lead to a puffy appearance. Combine this with eight hours of undisturbed sleep every night and you should wake up looking (and feeling) a lot fresher. 2. 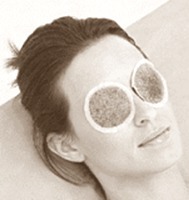 Place a cold compress, a cooled, used teabag, two chilled teaspoons, two slices of cucumber or a small bag of frozen vegetables wrapped in a soft cloth over your closed eyelids. This will reduce dilated blood vessels. Do this before getting ready for a night out to instantly revive your eyes. 3. Protect your eyes from the sun. Wear dark glasses and use a high factor sunscreen on your entire face. Sun exposure causes additional pigment production, which can make dark shadows look worse in the long run. 4. If you suffer from nasal congestion, try a saline wash or spray for relief. Create your own saltwater solution from 1/4 teaspoon sea salt and 2 cups of warm water and rinse your sinuses. Alternatively, many over the counter products are available; follow the manufacturer’s directions for use. 5. In addition to the above treatments, choose cosmetics carefully. You are spoilt for choice when it comes to prevention creams, gels and serums. Pick the right concealer for your skin; if you have bluish shadows use a peach-based concealer instead of a white or gray one.